Wait... There's THREE Cookbooks This Month?! That's right; we are offering you three different cookbooks this month!! They are all very different from one another for great variety, but I think you are going to want all three since they are really great cookbooks! I hope you enjoy the extra offer this month, and happy cooking! One of the most used, most standard, most familiar ingredients in a lot of the cooking I grew up with, and still cook today, is ground beef! It's a versatile ingredient in lots of different types of cuisine, and I think a lot of other people use it often as well. For all of its versatility, I still find myself using the same recipes over and over. That's what makes this cookbook so amazing, it gives you a whole bunch of ideas for using ground beef in a variety of tasty recipes! 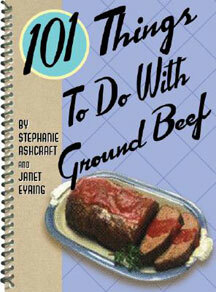 Just like the rest of the popular "101 Things" cookbooks that we've offered, this cookbook starts out with a few helpful tips about ground beef. There are some great buying tips-like how to read how lean the meat is, thawing and freezing tips, and general cooking tips. There are recommendations for what types of lean meats can be used in what types of recipes for optimal flavor, as well as substitutes like ground chink or ground sirloin. This cookbook does have a whole chapter of different kinds of meatloaf, but before you think that's all it has to offer, look at what else it has! Appetizers, Sides and Soups, Sandwiches, Burgers and Grilled Sensations, Main Dishes, and Family Favorites. These recipes are really easy to make and will really add a nice variety to your recipe collection. Here are a few of the recipes that you will find in this cookbook: Beef Wontons, Hawaiian Meatballs, Bacon Calico Beans, Stuffed Bell Pepper Soup, Gumbo Burgers, Texan Pitas, Green Chile Burgers, Stuffed Onion Burgers, Bacon Wrapped Burgers, Avocado Meat Loaf, Mac N Cheese Meat Loaf, Potato Covered Meat Loaf, Barbecue Pizza, Ginger Beef Bok Choy, Meatball Stroganoff, Empanada Pie, Stuffed Manicotti, and Quick Tamale Pie. The name of this cookbook says it all, doesn't it? 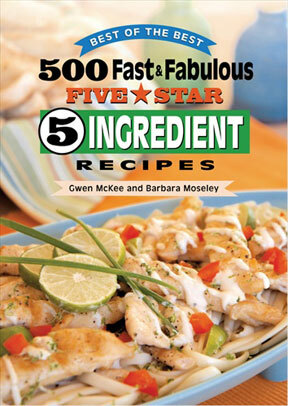 500 recipes, which is a fabulous addition to your cookbook collection, and all of the recipes have only 5 ingredients, which is absolutely amazing! With only 5 ingredients, the overall time in the kitchen is dramatically shorter. A lot of the recipes in this cookbook are actually from the personal collections of the authors, so they have tried and tested these recipes and recommend them for their ease and their taste! In addition to all of the great recipes, which I will get back to telling you about in a moment, there are also lots of great cooking tips, things like equivalents, substitutions, measurements, pan sizes for baking, and crock pot conversions. This is a great cookbook for anyone who is just starting out in the kitchen and wants to get more comfortable with the cooking process, or for anyone who is just looking to simplify their lives by reducing cooking time. Even shopping time will be reduced since you don't need a lot of ingredients for each recipe! This cookbook covers just about everything you could think of to make, so it's the total package. It includes: beverages, appetizers, bread and breakfast, soups, stews, salads and vegetables, pasta and rice, meats, poultry, seafood, cakes and pies, and more! It really has a little bit of everything, so you can feed your family what they want to eat, with less time and less ingredients which makes it all worth it. Some of the recipes in this cookbook include: Hot Chile Cups (you know how much I love anything with green chilies! ), Homemade Spiced Crackers, Taco Grilled Cheese Sandwiches, Pull-A-Part Parmesan Wedges, Apple Cinnamon Roll Coffee Cake, Mac 'N Cheese Soup, Toucan Corn Chowder, Creamy Oyster Stew, Grilled Fruit Toss (salad), Pretty Poppy Seed Salad, Frosted Grape Salad, Really Creamy Fettuccine, Shrimp Scampi Pasta, Pecan Wild Rice Supreme, Potato Tacos, Crocked Cajun Roast, Cabbage and Corned Beef (a favorite of my husband's), Sweet Apple Glazed Pork Roast, Spicy Oven Fried Chicken, Classic Chicken Casserole, Grilled Bacon Wrapped Fish with Herbs, Parmesan Flounder Fillets, Blueberry Pound Cake, Almond Chocolate Cream Angel Cake, Oreo Chip Muffin Cheesecakes, German Chocolate Caramel Brownies, Creamy Pineapple Pie, and so many more recipes that I just couldn't decide from! With 500 recipes, you are bound to find at least a few new family favorites! We have a new cookbook for you based around my favorite meal of the day, breakfast! I absolutely love breakfast food, and I serve it for dinner quite often! To me, breakfast is good anytime of the day. I am a definite advocate of the saying that "breakfast is the most important meal of the day", and it has actually been proven! We do function so much better with a good breakfast to start our day off, even if it's something simple like muffins and juice, it's so much better than nothing at all! Time in the morning always seems so short, which is why a lot of people end up skipping breakfast. Well, this cookbook has some amazing tips to still have a warm, delicious breakfast while saving time and making it easy to fit into that morning rush! Tips like making the breakfast items the night before (some of them will even bake in the oven with your dinner, then can be re-heated in the microwave! ), doubling the recipes then freezing the leftovers in individual quantities for fast breakfasts later, and pre-measuring dry ingredients so in the morning you only add things like milk or eggs and away you go! This cookbook also has a whole bunch of tips for optimal breakfast consumption, telling you what kinds of foods should be consumed to refuel your body, how many calories is best for a hearty breakfast, and tips on what to eat for breakfast that is healthy, filling, and delicious. Remember that a good breakfast will keep away those mid-morning munchies that have a lot of us reaching for the junk food as a filler. There are also tips on making your breakfasts as health conscious as you would like them to be with things like using low fat or fat free dairy products, different kinds of healthier flour, lean meats, and drinking water first thing in the morning to both rehydrate your body and to keep you from eating portion sizes that are too big. Here are some of the delicious recipes found in this book: Blueberry Brunch Casserole, Pineapple Banana Refresher, Apples 'N Oats Custard, German Oven Pancakes (I grew up on these and still make them often! ), Potato Ham and Egg Bake, Lemon Poppy Seed Bread, Orange Glazed Biscuits, Banana Split Waffles and Vanilla Syrup, Apple Walnut Crepes, Citrus Blueberry Muffins, Breakfast Crumb Pie, Slow Cooker Oats and Spice (this actually cooks overnight, so you wake up to hot breakfast! ), Cinnamon Roll Cake, Cranberry Orange Scones, Egg and Cheese Quesadillas, Raspberry Muffins, Pumpkin Streusel Muffins, French Waffle Cake, and Strawberry Chocolate Muffins. There are so many more recipes in this cookbook that I wanted to share with you; I think that these recipes will definitely put the "good" in your "good morning"!